The Honduran Congress is debating a law that seeks to regulate hate speech and “fake news” on the Internet. Honduran activists and opposition political parties say the proposal would function as a gag law aimed at silencing government critics. The motion was introduced less than a week after the contested inauguration of incumbent president Juan Orlando Hernandez on January 27. 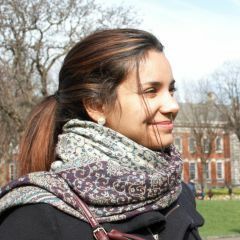 After a three-week period of uncertainty regarding the vote count, Hernandez was declared the victor, leading to a large public outcry and numerous street protests. The would-be law obligates website administrators and telecommunication companies to monitor and remove speech considered to be hateful, insulting, threatening or incitement to violence. It also intends to tackle “fake news”. Similar to efforts in other countries, including Germany's controversial new NetzDG law, this legislation would place the responsibility of determining what does (or does not) qualify as offending content on private internet platforms, like Facebook and Twitter. The experience of a company like Facebook, which already (under its own policies) seeks to keep hate speech off its platform, has proven that this is easier said than done. The law does not describe how, specifically, internet providers would implement such procedures, but it would require companies and administrators to submit a report on their efforts to a governmental commission, CONATEL, every three months. If they fail to do this, they can be fined up to 1 million lempiras (equivalent to USD 42,533) or have their website or account blocked altogether. The proposed law also envisions a Cybersecurity Commission, made up of institutions such as the Defense Ministry, the Supreme Court, the Finance Ministry and the Central Bank of Honduras along with a Consultative Counsel which include human rights experts, journalists, lawyers and university organizations. Marcos Bertilio Paz, the congressman from the majority party who put forth the proposal, justifies his motion as a protection from disruptive hate campaigns. Although he claims that everyone “can share content and opinions like before,” many citizens and civil society groups question his motives. The Honduran Journalist Association swiftly expressed concern about the law, arguing that it undermines democracy. The group also pointed out that proliferation of hate speech is already regulated by Honduran penal law. On the other side of the spectrum, a minority of Twitter users explain that no ill intention is behind the proposal. Others say that Honduran Congress’ legislative priorities are out of line, in light of recent allegations of corruption and relations with narco-traffickers in government ranks. Since the recent handover of power, which unfolded under a heavy cloud of suspicion of rigged polls, more than 30 protesters have died in clashes with the militarized police. And intergovernmental bodies including the Organization of American States have also cast doubt on the legitimacy of the election results. Many also believe that Honduran mainstream news is biased in favor of the government, making social media a logical target for the legislation. Congress is about to decide on blocking social media in Honduras, is that fair???? Los políticos en #Honduras le temen al poder de las redes sociales. As noted by International Central American Radio, social media provides a vital alternative for Hondurans to get their news and organize protests. Hashtags such as #FueraJOH (seen above, meaning “Down With Juan Orlando Hernandez”) have created strong momentum online and offline for citizens to show their discontent about the election results. The recent news of Honduras’ government acquiring spyware from the UK further complicates the perception around these changes in the law. According to The Guardian, the UK sold telecommunications surveillance equipment to the Honduran government shortly before the explosion of protests that contested the results of the elections. Some activists argue that this confluence of events and issues will effectively consolidate a dictatorship has been on the horizon since the 2009 military coup. Recent years have witnessed a surge of violence against those who speak out and another new law, under Honduras’ penal code (Article 335 B), that restricts the freedom to demonstrate on national security grounds, creating legal grounds for authorities to accuse activists and demonstrators of threatening national security and even terrorism. This change has created unique hurdles for environmental activists and indigenous land rights defenders and compounds the many perils activists face throughout the country. 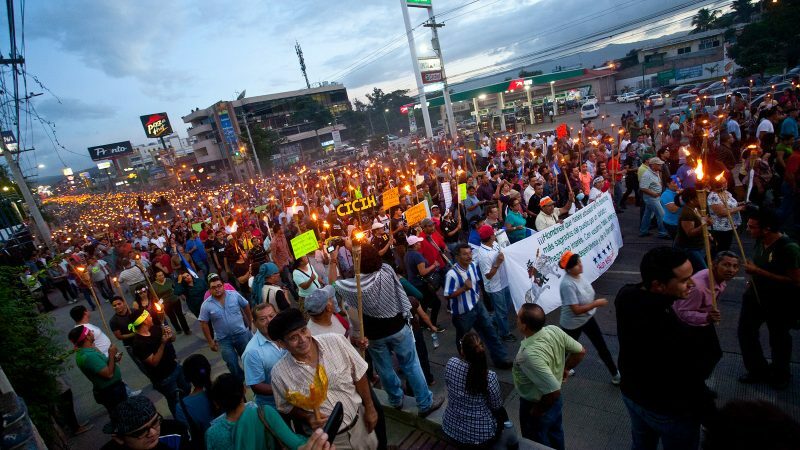 Since 2010, more than 120 activists have been killed in Honduras with relative impunity. Ofraneh, a Honduran association defending ethnic minority Garifunas peoples‘ rights, has highlighted the implications of Article 335 B, and the fact that the article was introduced without due process. Despite efforts to repeal it, the Congress refused to make any changes. The implications for land and environmental defenders, as well as human rights defenders are worrisome, given the context of vulnerability and the level of stigmatization of their causes and activities, that often includes protesting. As Ofraneh's tweet underlines, these laws set the path for stronger and more restrictive laws that can be translated to more limitations to freedom of speech and stronger backlash against dissidents.